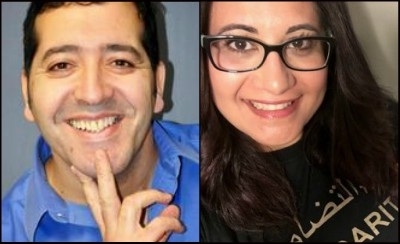 Linguistics professor Karim Achab and writer Yasmine Mohammed testified before the Canadian parliament's Standing Committee on Canadian Heritage on November 8. A professor of linguistics at the University of Ottawa, commenting on the so-called anti-Islamophobia motion, M103, has urged the Trudeau government "to start an international Commission on how to handle the violence in the Qur'an," which, he says exists, without doubt. Professor Karim Achab gave his presentation on Nov. 8 to the Standing Committee on Canadian Heritage regarding the motion on systematic racism and religious discrimination, which focuses on "Islamophobia." Using a PowerPoint presentation, Achab, who is of North African Amazigh (Berber) ancestry in Algeria, said "Islamophobia" is an inappropriate, unjustifiable word. He then focused on the definition of "Islamophobia" offered by many Islamist activists: "The irrational fear or hatred of Muslims that leads to discrimination or actual acts of harassment or violence." Achab suggested the word was an example of "academic lexical creation" and, even though people have the right to create such words, they should have no place in parliament or law. Dissecting "Islamophobia," the linguistics professor told MPs, "phobia (is) a medical term referring to one type of mental disorder." And yet, he noted, no one speaks of Coptophobia, even though, "Copts are slaughtered daily in Egypt." Alluding to anti-black racism and the genocide of the Yazidis by Islamic State, the professor asked why there were no words for "Blackophobia" or "Yazidiphobia"? According to Achab, the word 'Islamophobia' is an 'academic lexical creation' that should have no place in law. If the clarity and explicit language of Achab gave the Liberal MPs and their NDP wingmen heartburn, what was to follow left them gasping for a politically correct response. The next speaker was my friend, Yasmine Mohammed, another Canadian of North African Arab heritage. She was born in Canada in a strict Islamic environment but has today stepped back from the faith. Mohammed introduced herself to MPs on the committee with these words: "I was born and raised in Canada. I both attended and taught in publicly funded Islamic schools in Canada. I wore a hijab from the age of nine in Canada. And later, when I was forced into a marriage with a Jihadi, I wore a niqab, here in Canada as well." Getting straight to her point, Mohammed said: "M103 is doing the exact opposite of its intent. Rather than quelling bigotry, it is feeding the fire because it includes the word "Islamophobia" that is not about protecting people — Muslims — it is about protecting the ideology — Islam." She addressed the fear of Canadians whom, she acknowledged, have "been naturally uneasy and suspicious about how a so-called peaceful ideology (Islam) could be spilling so much blood." M103 is 'not about protecting people,' according to Mohammed. 'It is about protecting the ideology." Then she told her story. It moved even Liberal MPs who, for the most part, have insulted Muslims who have opposed M103 before the committee. Mohammed said: "But to people like me, people with backgrounds in the Muslim world, this is blasé. We have been dealing with Muslims killing in the name of religion for 1,400 years. We are accustomed to Islamists, like the Muslim Brotherhood, and Jihadis like al-Qaida and ISIS. "I was married to a member of al-Qaida. I had his baby. None of this is a mystery to me. None of this is new." Later, not one Liberal or NDP MP asked her a single question. It was as if she had never been there. Maybe the professor and the ex-niqabi should have worn multi-coloured socks and placed their feet on the table. Hell, even the mainstream media would have covered that.